The Rebellions were especially important since they coincided with a momentous period in American history. The United States was in the midst of the Jacksonian democracy; the Panic of 1837 and the broader economic transformations that some historians have called the “Market Revolution” were causing acute economic anxiety; Texas had seceded from Mexico; American territorial expansion was well underway; and debates regarding slavery raged on. In this critical context, Canada’s Rebellions played a major role. They became a source of conflict and debate. Like the Texas Revolution and the creation of the Republic of Texas, there were important social, political, and economic stakes with the “Canadian Revolution” and the prospects of two independent Canadian Republics. Though the rebellions have been the subject of numerous studies in Canada, the American perspective remains underappreciated. Most Canadian scholars have considered the event from a local and Canadian perspective. The Rebellions’ causes and consequences remain generally rooted in Canadian context and historiography, focusing on the longstanding Canadian struggle for nascent nationalism. The studies of the event from an American perspective limit themselves to the Hunters’ Lodges and their general involvement in the conflict. They do not explain what social, political, or economic factors pushed Americans to oppose or support the Rebellions. And though there have been numerous studies on the momentous changes that defined this period, they overlook the impact of Canada’s Rebellions on the transformative events that were taking place to the south. My project investigates the place of the Rebellions in the United States. Based on the works of transnational historians, like Daniel Rodgers, David Thelen, Michel Ducharme, and Alan Taylor, historians that have shown the importance of studying regional events from a transnational perspective, my overall project takes the Rebellions out of their Canadian context and places them in a North American one. It investigates how the American social, political, and economic context (as described above) shaped their responses to it, and argues that this Canadian conflict had a significant impact in the United States. Map of the states and territories of the United States showing which areas of the United States did and did not allow slavery between January 1837 and March 1837. Wikimedia Commons. Did slaveholders use their influence in Washington to prevent any attempt to free Canada from the yoke of British imperialism in order to prevent its independence and subsequent integration in the United States? Did slaveholding interests shape American official neutrality? This is where my time in Philadelphia and at the McNeil Center has pushed my research. It has refocused my more general examination of the United States and the Rebellions around the issue of slavery. It has pushed me to consider the Rebellions and Canada’s place in the slave debates that were dividing the United States and how slavery in the United States—a subject that is of little concern to most Canadian historians—influenced the course of one of the most important events in Canadian history. More importantly, it has led me to consider how the Rebellions in Canada—a subject that is of little concern to historians of slavery in the United States—shaped the slave debates in the United States. As such, I hope to follow in the footsteps of historians like Caleb McDaniel and look at the slave debates in America as a transnational phenomenon that involved Canada and the Rebellions. Maxime Dagenais (PhD, 2011, University of Ottawa) is a SSHRC postdoctoral fellow at the McNeil Center for Early American Studies at the University of Pennsylvania, and studies the American reaction to the Canadian Rebellions in the context of the slave debates. He is currently coediting a collection on the subject scheduled for publication in 2017 with Early American Studies, published by the University of Pennsylvania Press. One of the only published studies to make an explicit link between Jacksonian ideology and the Rebellions is Andrew Bonthius’ “The Patriot War of 1837-1838: Locofocoism With a Gun?” His article suggests that concerns over capitalism and the disappearance of traditional socio-economic values were present amongst some supporters of the Rebellions in Ohio. Andrew Bonthius, “The Patriot War of 1837-1838: Locofocoism With a Gun?” Labour 52 (Fall 2003): 9-43. For example, see Charleston Mercury, 3 & 8 & 19 January 1838. Matthew Karp, “This Vast Southern Empire: The South and the Foreign Policy of Slavery, 1833-1861.” Ph.D. Dissertation, University of Pennsylvania, 2011 and The Public Ledger, 13 December 1838. Caleb McDaniel, The Problem of Democracy in the Age of Slavery: Garrisonian Abolitionists and Transatlantic Reform (Baton Rouge: Louisiana State University Press, 2013). 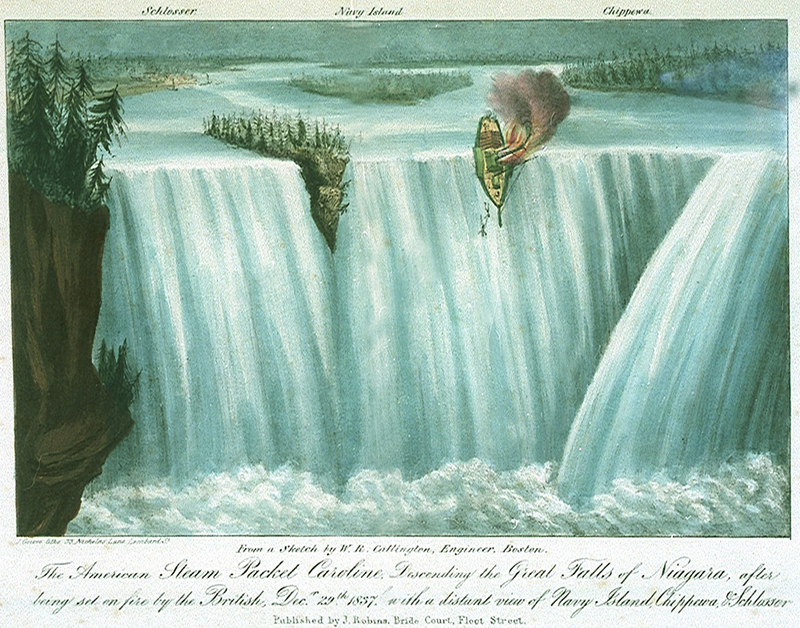 Image: “The American Steam Packet Caroline Descending the Great Falls of Niagara after being set on fire by the British, Dec. 29, 1837.” After W. R. Callington, 1838, National Maritime Museum, Greenwich. Creative Commons License. A most valuable introduction to an important topic – the influence of the Rebellions on US policies and politics. This thoughtful piece might, however, have made some reference to William Lyon Mackenzie, whose newspaper in support of the cause of Canadian independence, soon found itself mired in US politics. Indeed, WLM, as a “rebel leader” who “sought refuge” in the “American border towns” of Buffalo and (later) Rochester. Also his son, James Mackenzie, edited a “Hunter Lodge” newspaper for six months in Lockport. Thanks for your comment and for reading my post, Chris. William Lyon MacKenzie is indeed a very important figure in the Canadian Rebellions and one I am very familiar with. I’ve had the pleasure of reading his newspaper, Mackenzie’s Gazette. However, for this project, he plays a secondary role, like all of the other rebel leaders like Louis-Joseph Papineau, Robert Nelson, and Edmund B. O’Callaghan, to name a few. Though MacKenzie is present in my more general project (he had some contacts with abolitionists), I am not interested in *his* or the *Canadian* perspective per se. I am interested in the American perspective and more particularly that of American slaveholders that had little to no contact with rebel leaders. Thanks again for reading and stay tuned!